A movie that never wears out its welcome. My applause at your ability to sell the movie and not sell out the ending. When I first showed this movie to my daughter when she was in high school, she leaped from her chair and shouted “That was freaking awesome!”. For me, it was like seeing it again for the first time. Thank you very much! I must confess that I react like your daughter each time I see this film. Fun review! I actually read the original play first and remember cackling out loud at the final reveal. I pride myself on being able to unravel mysteries but I was not prepared for that one. Thanks for participating. Thanks, it was great fun to re-watch it and write about it. Glad you like it and thanks for your comment. 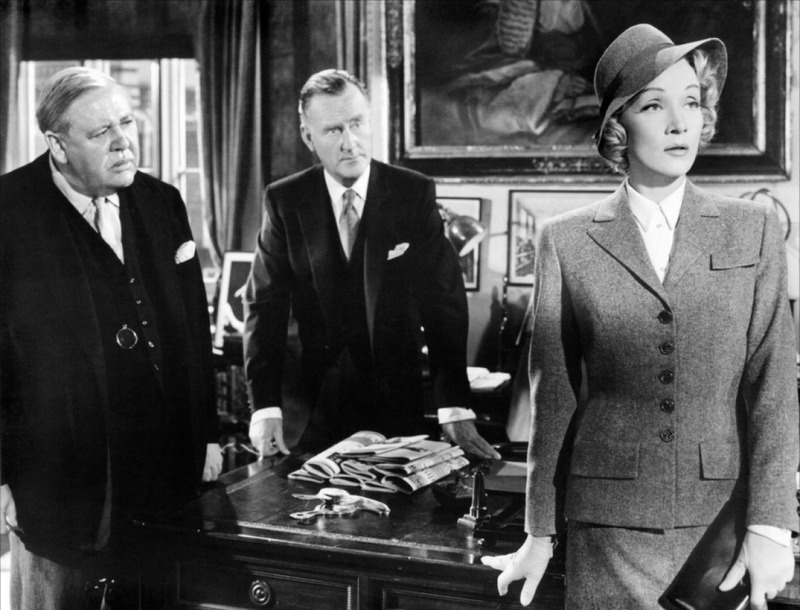 This is a wonderful film, and I agree that Charles Laughton is fantastic in this and really makes the movie, as far as I’m concerned (although the mystery is great, too – another one of Dame Agatha’s fiendishly clever constructions). Have you seen the 1982 TV movie remake with Ralph Richardson in the Sir Wilfrid part? It’s a good watch as well, and also boasts a great cast: Deborah Kerr (as Sir Wilfred’s nurse, Miss Plimsoll), Diana Rigg as Christine Helm, Beau Bridges as Vole and Donald Pleasence as the prosecutor, among others. Certainly one of my favourite reveals and one that I (not unusually!) didn’t see coming. Dietrich is so much better in this than I thought she would be, her role was really strengthened by the excellent screenplay. Thanks for reminding me about one of my favourites! It was a treat to re-watch it, thanks for taking the time to read my review. Oh boy! I love love LOVE this movie. The acting is SO GOOD! You could almost say this is a perfect movie…if such a thing exists. I couldn’t agree more! Thanks for stopping by and sharing your thoughts. You are right, Laughton and Dietrich make the movie. Thanks for stopping by and writing a comment. This is a great, great, great movie. Too bad it doesn’t receiv reruns here anymore, or I would watch every time it is on TV! The end left me speechless. Well, nothing can go wrong with Billy Wilder and Agatha Christie together! Thanks for reading my review, I’ll check out yours for sure :-). Laughton had an amazing late stretch in his career. This and Advise and Consent are particularly good. I agree, he gave some fine performances in his old age. I have a lot of time for Laughton (Rembrandt, Hobson’s Choice, Henry VIII etc) and he didn’t let me down in this. Unfortunately, even as a young viewer, I did get the ‘big twist’, but it didn’t spoil my enjoyment of some great performances. There are indeed some great performances in this one! Thanks for reading and commenting Pete.